New & Popular Add-On Package! 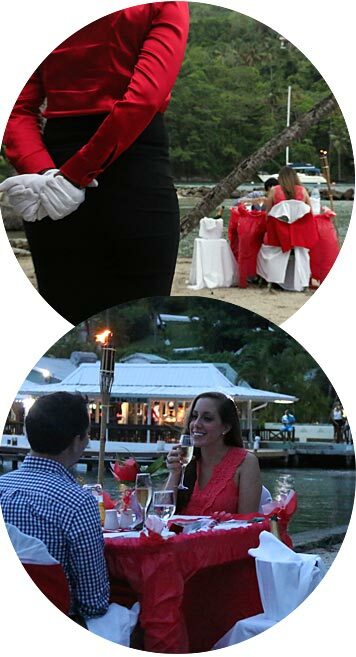 Enjoy a delicious and romantic sunset dinner at a candle-lit table-for-two with dedicated white-glove service on the quaint little Marigot Bay beach. The melodic waves and rustling palms set the course to your evening while the breeze tickles the flames of the tiki torches and the glow of lights cast mesmerizing reflections across the bay. Bask in each other’s company as your personal butler takes care of everything. Our Dinner on the Beach Package is the ultimate in romantic dining and will set the course for one amazing night together. 1 bottle of champagne or wine. This package can be added to your reservation upon booking online or you can book it now. You can also give us a call at 1-800-263-4202 to book over the phone. Price includes tax & service charge. Select Properties: Currently only available for villas located in Marigot Bay, including the Vacation Club, the Villa St. Lucia, the Great House, the Emerald Hill Villa, the Caribbean Blue Suite, the Marigot Sun Villa, Les Jolies Eaux, and Serenity Bay Villa. The Dinner:: Dinner is prepared by the Doolittles Restaurant but features a custom menu only available for the ‘dinner on the beach’ guests. Once booked, our team will confirm with you for any dietary needs. Good to Know: It’s recommended to wear long pants and closed shoes, but if you prefer to wear sandals or open-shoes, you may wish to wear bug spray on your feet. In the case of rain, the table will be moved under a covered roof a the Doolittle’s Restaurant. This package is ONLY available to guests of Oasis Marigot. Booking: Reservation must be made at least 48 hours in advance. Dinner time is from 6:30-8:30 pm. A 50% cancellation fee is applicable for cancellations within 24 hours of dinner for Resort Bookings. A 100% cancellation fee is applicable for cancellations within 24 hours of dinner for Pre-Bookings.